Boy do we have a neon treat in store for you today! 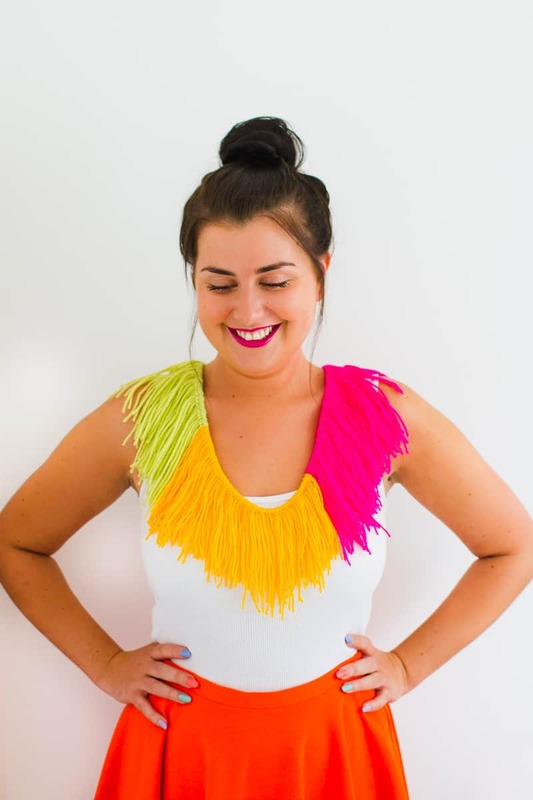 We all know fringes are having a big moment, especially in the festival scene so we couldn’t help but go a little fringe crazy and make this fun and colourful statement necklace! This DIY took less than 2 hours and can be done in 3 easy steps! I’m not even kidding, it really is THAT simple! Take your leather lace and tie it securely together to create a necklace shape. Then cut your yarn into roughly 15cm pieces, it doesn’t matter if they’re not perfect because you can always trim them later if you need to! We cut around 80 pieces per colour but just play it by ear as you’re going along! Create a loop in the centre of your strand of yarn, place that over top of your leather lace then thread the two strands hanging down through the loop and pull tightly! Repeat with all of your yarn all the way along your lace until you’re happy with the block colours then trim if you think any pieces look obviously longer than others! And then you’re done! No joke, how easy was that guys? We absolutely loved the different ways you could style this necklace, wear it regularly, off the one shoulder or even have it sitting off both your shoulders! Super pretty! Might I ask how you tie off the leather lace to keep the fringe in place? We didn’t need to. If you tie the yarn tight enough it won’t move. What a wonderful choice of tones! What is a yarn, you used? Thank you! It was just wool bought from a local store. You are lucky – I searched for the tangerine-yellow (not lemon yellow) neon yarn pretty long, before I succeeded… And the way, the yellow and the lime tones work together, is really great.